The festival of All Saints, also sometimes known as All Hallows or Hallowmas (“hallows” meaning “saints,” and “mas” meaning “Mass“), is a feast celebrated in their honor. Halloween is the day proceeding it, and is so named because it is” The Eve of All Hallows”. All Saints is also a Christian formula invoking all the faithful saints and martyrs, known or unknown. The Western Christian holiday (called Festum omnium sanctorum in Latin) falls on November 1, followed by All Souls’ Day on November 2, and is a Holy Day of Obligation in the Latin Rite Roman Catholic Church, with a vigil and an octave. Among the Eastern Orthodox and Eastern Rite Catholics, All Saints follows the earlier tradition kept by the whole Church of keeping the feast on the first Sunday after Pentecost and as such marks the close of the Easter season. # 2006 November One comment No hashtags. ‘ what command do you want to call? # 2006 November 3 comments No hashtags. I trust that the universe is unfolding as it should. # 2006 November Zero comments No hashtags. # 2006 November One comment delicious . # 2006 November Zero comments delicious . Yes, I did. The End. Updated, and it works. Me likey. # 2006 November 2 comments delicious . The times, they are a- … well, you know the rest. I don’t really feel very cool today, but I caught a few minutes of the Charlie Brown Thanksgiving Special last night, and, well, here he is. Or is that me? My grandmother made clothes for my Snoopy. 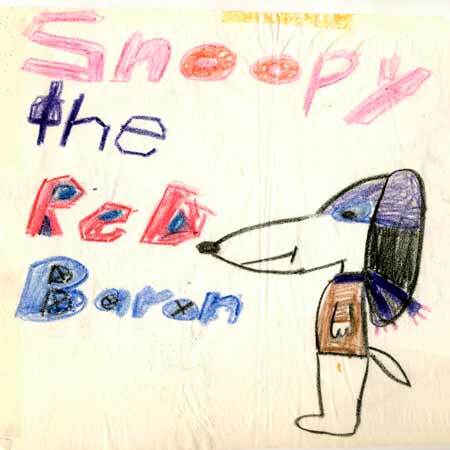 As a matter of fact, I think I still have the clothes she made for my Snoopy. He had a cape, and a Sailor’s hat. It’s in the garage where there are some artifacts from my boxed-up childhood. It makes me stop to consider my life. Will I consider it to have been worthwhile? I’ve been making changes toward what it is that I want, and it’s been a great transition. But a hard transition. Very damn hard. It’s hard to look yourself in the heart and figure out what’s there. But it’s infinitely rewarding too. It’s been a necessary process. Yo kids, onward, as to war. # 2006 November 2 comments art Charles Schulz comics . Very very funny. See also: Galactus. Chick Tracts. (Maybe you have to be familiar with the Marvel Universe and disturbing Christian fundamentalist comics to find it funny, though). I’ve never written anything *this* bad. But I’ll admit to writing pretty bad stuff. Makes me want to go to that little museum. my friend missewon will have surgery today. please keep a good thought and/or prayer for her. July of 2005? I believe we were on a drive back from, or to, San Diego and we stopped at a Circle-K — I think it was in San Marcos. 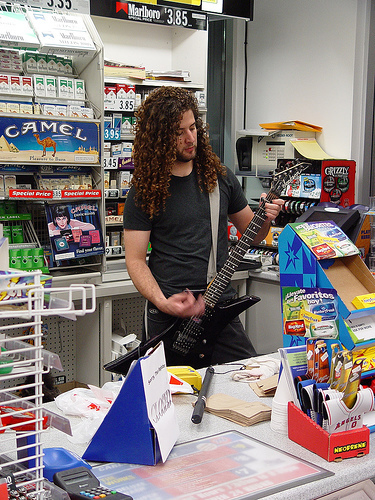 And this dude was minding the store, and practicing his shredding. (And yes, wikipedia has an entry for shredding). Leah snapped these photos, though for the life of me I’m not sure she ever wrote about it. I think she was the one who asked him if it was okay to be photographed. I’ve been cleaning house on my servers and found the photos, so there it is. Update: she did post it. # 2006 November 2 comments No hashtags. What are you doing reading me? Shouldn’t you be eating turkey or tofurkey? p.s. : I am thankful too. There is so much to be thankful for. And Leah, me too. I’m prayin’ for ya gal. Rock on. 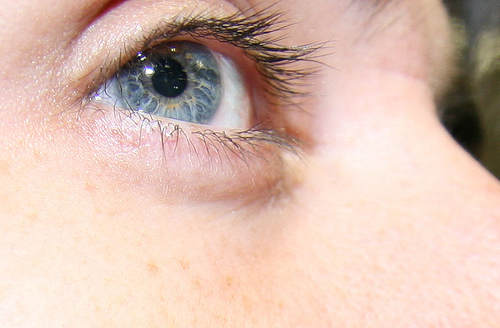 At least my eye is. Thanks for showing me this Leah. I’m pretty sure this is where I been. I’ll defer to my family for fuller information. Also add The Philippines, England, France, and Italy. And Guam and Japan, though I was only in airports there, so it scarcely counts. You have to know where you been to know where you’re going, right? Today: boys have a playoff game for their team, and I intend to buy a bike. I been pricing them and I think I know which one I want. Last night I saw “Stranger than Fiction” and was moved. Really beautiful movie.